The Phuthaditshaba athletics club is encouraging children to keep away from the bad. A Wits security guard and retired runner is using his passion for athletics to train children from Hillbrow, Berea and Alexandra. Zimasile Tobo co-founded the Phuthaditshaba athletics club with runner Onica Motsei in 2011, following Tobo’s forced retirement after a spinal injury. The athletics club trains a group of about 30 girls and boys (aged 10 and older) in various track and field events. “I just want to plough back for the development of future athletes. I thought I should do something and give back to the community and nurture the young ones,” said Tobo. Speaking in isiXhosa and English, Tobo said that they used to train at Pieter Roos Park which was not a safe environment for the kids. “The park is full of homeless people and people who use drugs, but since we got the opportunity to train at Wits, it became better. As a result, our kids love participating in sports because the environment is very good,” Tobo said. “We didn’t have an official coach and we asked him if he would be interested in training athletics at Wits and he was happy to do so,” Vuyeka said. 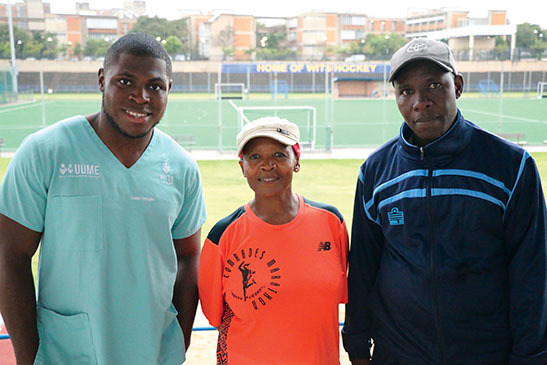 For the throwing events (shot-put, discus and javelin), Tobo is being assisted by fourth-year medical student, Daniel Omoighe, who decided to offer help when he noticed the kids training. “I was coming to run around the field… I decided to come help because I could see they were doing it all wrong,” he said. Omoighe also assists with the training technique. “We teach them footwork, give them advice on how to train because a sprinter trains differently from a field athlete,” he said. Motsei told Wits Vuvuzela that the club is keeping the children away from being exposed to the wrong things. “This running will keep the kids away from drugs and from trafficking, especially girls,” she said.